It was snowing a bit when we got up this morning. My son and his girlfriend were home for a visit and we got to discussing the Christmas menu. It put me in a creative Christmas mood. 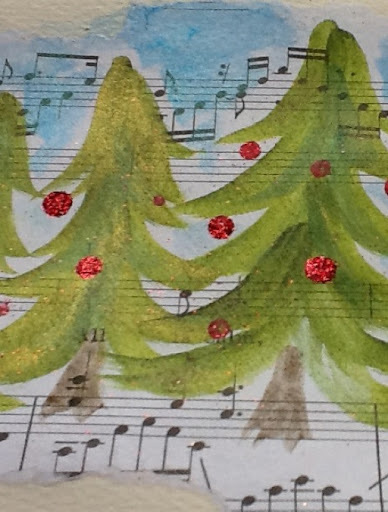 After reading Leslie's blog this week, I starting thinking about painting my own Christmas cards. 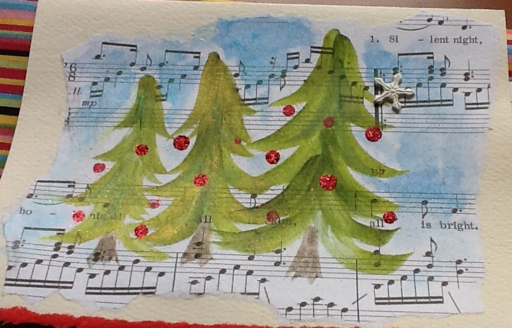 This one is painted on a purchased watercolour card onto which I glued the music for Silent Night using matte medium. 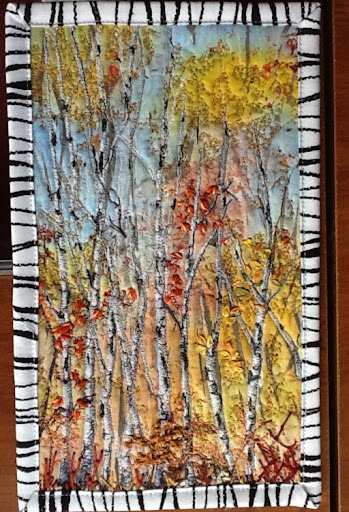 Then I applied a thin layer of clear gesso and once dry, I painted the trees using Silks acrylic paint. A little sprinkle of glitter dust makes the red bulbs sparkle. 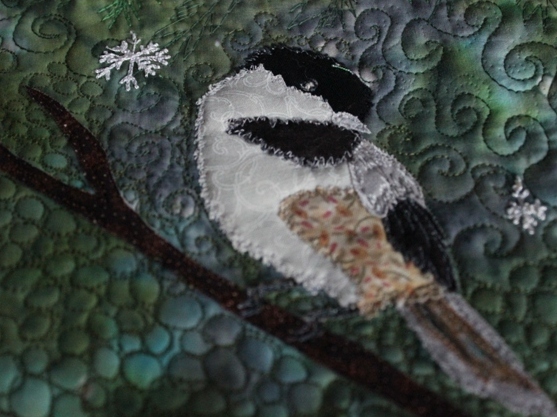 I have to apply the music to a few more cards, but in the meantime, I added the finishing touches to the chickadee. A little glitter may find itself on this one too! I've sent everyone emails but neglected to ask for addresses! Can you email me with your mailing addresses please? Also, if you make one with the kit, I'd love to see it. I didn't get much creative time today; did errands and had lunch with friends. 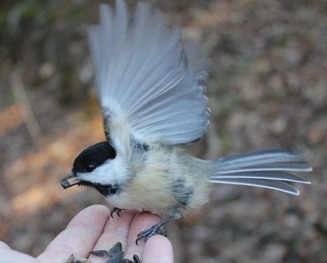 Then as it was exceptionally mild and sunny, I took a walk down the trail, feeding some chickadees along the way. There was one I was able to identify by a little white spot on its head that followed me down and back. It seemed a little more brazen than the others too, staying for a bit to eye me and peep at me. Now I'm curious to see if the same one will be around next time. 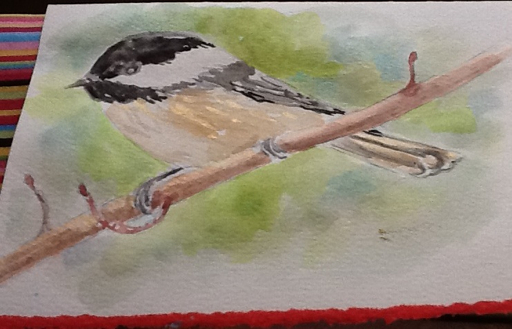 I started some quick chickadee sketches and a small watercolor yesterday but did not get back to finish it today. It needs a few touch ups and a little darkening in the background to make it show up better. It's promising to continue to be decent weather and my son and his girlfriend are arriving tonight so I think it'll be a nice weekend. Would you believe most of my shopping and gift making is done? My daughter's gift had to be mailed almost two months ago in order to make it to Korea for Christmas. We've kept it minimal this year for the rest. My husband and I are not putting gifts under the tree because we just bought an electric fireplace for our living room. I'm pretty excited about that as we haven't had a real fireplace in years. Having thyroid issues means I'm often cold in winter, especially at night. This will add to the heat and the ambiance. This is the Christmas project I mentioned yesterday. It's all ironed down and ready to stitch. The pattern came in a free e booklet from Quilting Arts. You may find it on their site. 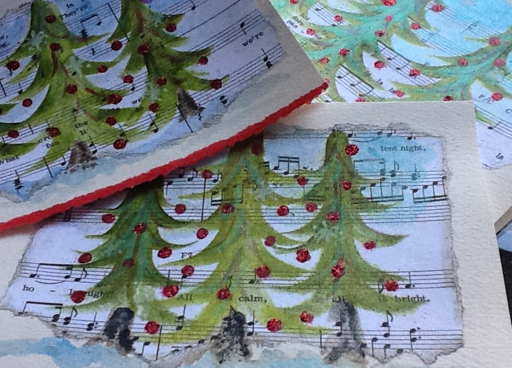 My colours are almost the same as theirs but I had to use less Christmas fabric as I didn't have any. A couple of the greens are actually batiks. Ist sat down with a cup of chai spice tea and ginger snaps to write this post. This morning I did my swim, had a lovely lunch at my swimming buddy's, and then I stitched together some Christmas color fabric to make a table runner. I'm still cutting out snowflakes to be appliqued so I'll post that tomorrow. 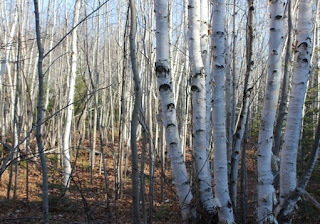 I want to show you a couple of photos from my trail walk yesterday. Every time I wonder if I should carry the camera, I find some new beautiful detail or a view and a color that catches my eye. 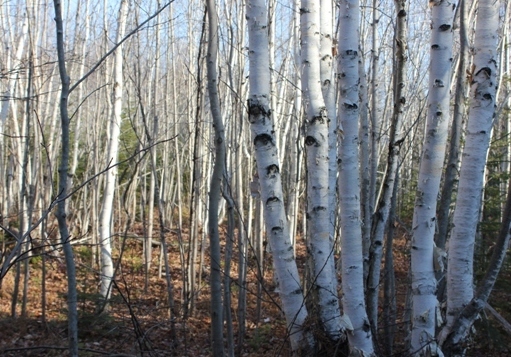 Yesterday, while taking this photo of birch trees (I wonder how many of them I have? 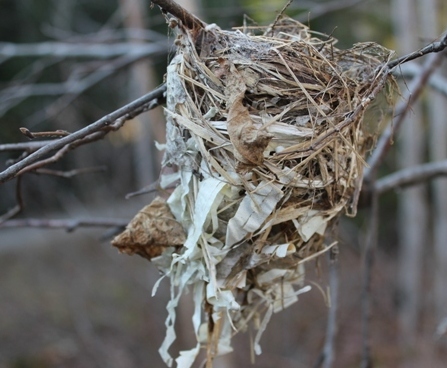 ), I noticed an exquisite little bird's nest. I've never seen one made with birch bark before. Isn't it beautiful? Of course I couldn't resist photographing more chickadees even though I told myself I don't need them! Some of you might remember the last birch piece I was working on with all the machine quilting. Well, I had really gotten into free motioning some maple leaves as an accent, but before I knew it I had covered up too much of the birches. I really wasn't happy with it but didn't want to waste it so for the last few weeks, I've been meticulously picking it out, an activity I could only do by day. I got it all out and carefully redid a bit of red here and there. I'm happy now. Thanks Wendy for affirming what I knew was best! I've started adding a bit of hand embroidered leaves to it. I think that's just about it. I'm connecting to the Needle and Thread Network for WIP Wednesday. Also, I have a giveaway going on this week sponsored by Sew Sisters quilt shop. You'll find details in yesterdays post. 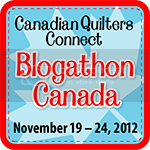 I'm so excited to be taking part in Blogathon Canada which is organized and sponsored by Sew Sisters quilt shop. It's my first time to be included in something like this, so of course I'm a little nervous to get all the details right! My blog is coming to you from Bathurst, NB. I'm Holly and I've been crafting for as long as I can remember and quilting since I was a teenager. I learned to hand piece first and later moved onto machine piecing. This is the latest baby quilt that I did. Can you tell I like modern with bright colors? 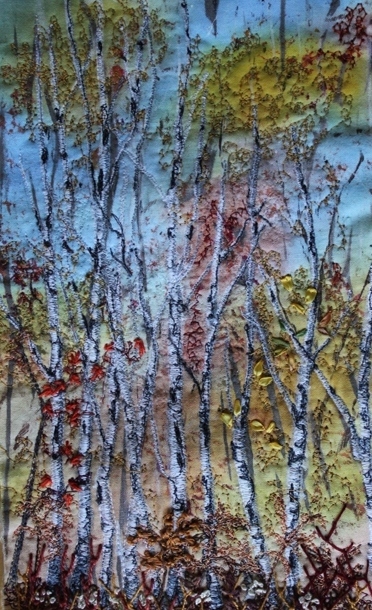 Although I still like to put together a few quilts per year, I spend most of my time on my art and and fiber art. I am influenced by the scenes 'through my window' and by the many things I see on my walks on the trails. 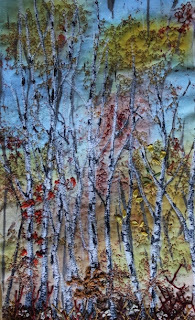 I am driven to attempt to express what I see and feel into fabric and fiber and therefore I tend to follow the seasons with my piece at the time. For example in early fall I was working on this piece. 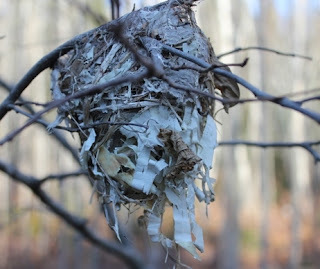 My latest piece was inspired by my walks on the NB Trail while feeding one of my favorite little birds, the chickadee. When Sew Sisters told me I could pick fabric to give away, I thought I'd pick some in the colors of my chickadee piece and offer my pattern at the same time. They responded by cutting the fabrics and assembling 8 kits to giveaway! Yes, there are 8 kits to win! Those are great odds! All you have to do is leave me a comment on this post and you'll be eligible. I'll make the draw on the last day of the blogathon, November 24th.I've added the chickadee pattern under pages on my sidebar. It will have to be enlarged about 120-130% once you've saved it to your computer. I'd love to see what you do with it! I've just added the pattern to the top of my pages list in my sidebar. You can copy the pattern, save it and enlarge it to the size you'd like. I tried it and it comes out just slightly smaller than the size I used, so about 120% would work. I had a giveaway a while ago for some stars that I had hand pieced and almost made into a table runner. 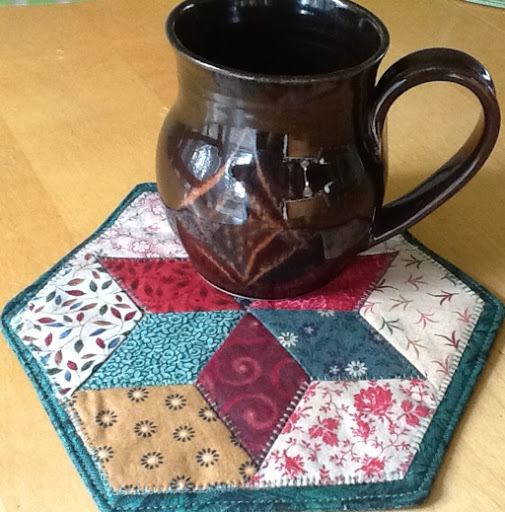 When I got home today, I found a little parcel in my mailbox where I discovered this lovely little mug mat made by Linda who was the winner. Isn't it sweet? She took one of my stars, added the set in triangles and made me a mug mat. Tomorrow, I'm going to UFO day laden with some Christmas sewing. It'll be hard to do a lot of blogging as I'm planning a few hand made Christmas gifts that will have to remain a secret. I got so excited to finish the chickadee and add the binding that I forgot to add the backing and the hangers before sewing on the binding! Does anyone else do that? I still have to hand stitch the binding to the back, so I cut the corner hangers and the backing and I'll tack them in as I stitch it down. I felt that the background needed a little something. Using the bobbin work method, I stitched 3 snowflakes. The thread in the bobbin is quite heavy making it a bit of an imperfect process. That's it for today. I'd like to keep working but I must get outside for some fresh air. There are a couple of fall projects that I've almost finished; however, I'm considering sidelining them to start some Christmas sewing. It'll mean more UFO's though. I was suffering from the dreaded skipping of stitches while trying to free motion the chickadee this afternoon. My plan was to quilt it, bind it and move on. In order to find the right color, I tried out a couple of different threads. When it skipped large stitches, I picked it out, changed needles and tried it on a sample piece. As soon as I sped up, it skipped, so I changed bobbin thread. Then I changed the top thread and the needle. You can feel the frustration can't you? So, I finally got it fixed by going back to my Gutterman thread with my usual needle and it is working. The piece is only slightly larger than 8 by 10. After all that I needed a break to distress for heaven's sake! So I'm having my snack and a cup of tea. I did just receive some fun news though from the Sew Sisters fabric shop that is hosting the Blogathon next week. Since I chose to have fabric that would do for my chickadee pattern and it is quite small, they have suggested that I have 5 winners!!! Isn't that fun! So check back with me on November 20th and check out the other blogs participating as well. The button is on the right. 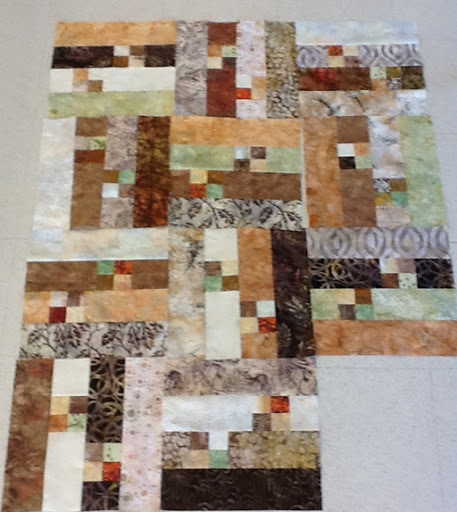 I gave a workshop today with 5 quilting friends. My aim was to pass on some of the fun that I had putting my baby quilt together. It definitely was catchy as everyone seemed to really enjoyed it. They barely took time to eat! My friend, Anne caught on immediately and took off on her own. We opted to fussy cut a focus fabric and she added her strips to those pieces. It's not the best quality photo as I used my I pad so we could view the layouts easily. It's a very striking quilt! This one by Elise, is just over halfway put together. It was really fun to see it done in five different styles and colours of fabrics. I'll share more another day. 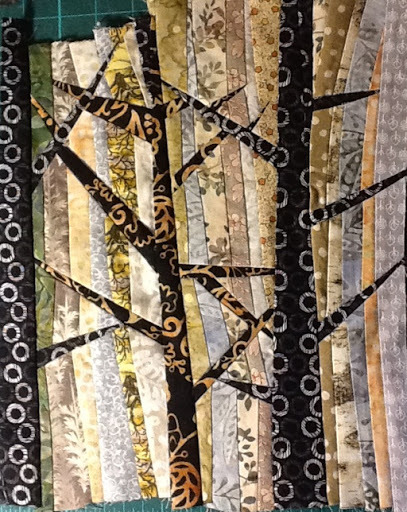 For more quilting and needlework blogs, go check out the Needle and Thread Network. It's a sunny, slightly warmer(10C) day than it has been and I've got my sheets on the line. I'm just trying to decide now if I should leave the background as is or fill it with quilting and if so what pattern. Maybe a meandering zig zag? My plan is to refine the pattern and send it to anyone who wants it. 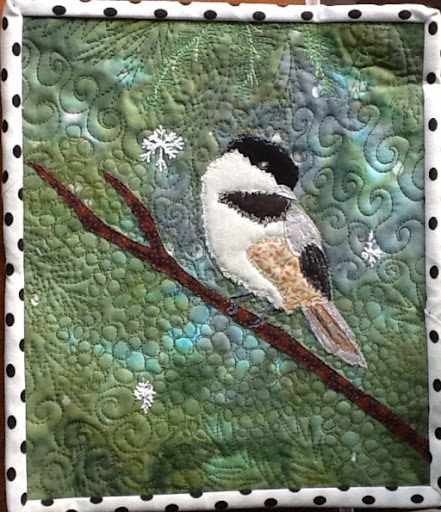 I am not a pattern writer but I will do up the chickadee and its pieces as a pdf. Also, my giveaway for my featured day, November 20th, will be the fabrics (provided by Sew Sisters) to go with it. Lest you think that I may have given up on my free pieced trees, I have not. Hopefully I'll finish that piece up this weekend. 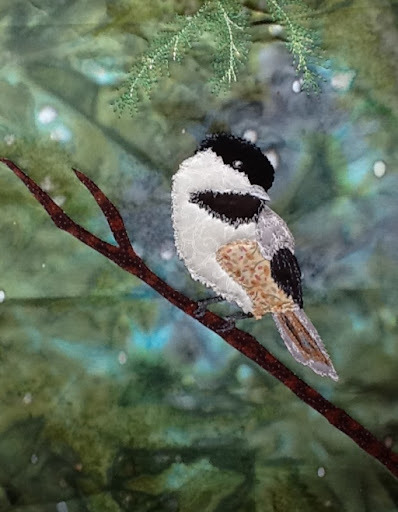 I need to get the little chickadee appliqué at least laid out on the fabric so that the Sew Sisters staff can choose some fabrics for my featured post and giveaway on November 20th. This is a rough idea of what it will look like. It's not ironed down yet as I have to finish the feet and add the branch. I will feature it on my day, hopefully a little more finished. Also, I plan to make the pattern available to those who would like it. 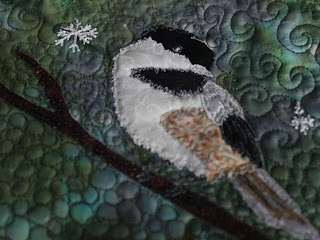 And my idea is to have my giveaway fabrics match the chickadee. What do you think? I wish everyone a good weekend. It is a weekend of remembrance and a long weekend for some. 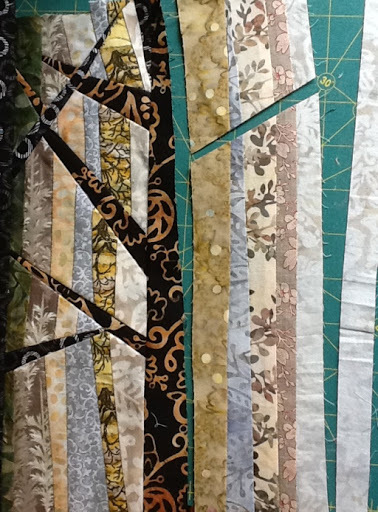 My goal this afternoon was to add a piece to each side of my trees, but it proved to be too much. 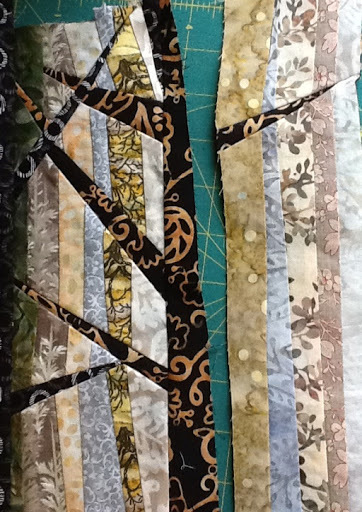 In the photo above, I've sewn four strips together before adding a cut and a 'v' of the black fabric for the top branch. Next I added a short strip to the top left to make up for the bend you get when the branch is inserted. After that, I sewed a fifth strip to the right side and made another cut for the second branch. 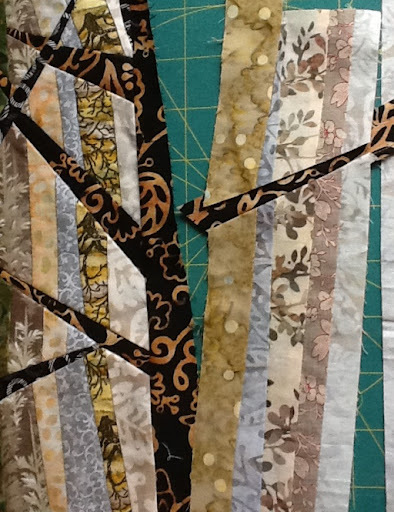 Following the same process I added a third branch, trimmed it all and sewed it to the central tree. The left side will wait for another day. It is a cold, windy and wet day here today. Add to that our recent time change, and we've got quite a dismal afternoon. I had hoped to sit by the window to do a little more picking out of stitches on one of my pieces, but it's too dark. I'm 'cosied' up with a cup of tea at least. I've got to go put my squash in the oven to bake so I can take it out and re- stuff it for supper. I got the right side added on. It was my second attempt and I'm still not completely happy. I figure its time to absorb what I've learned and move on. At the moment it is long and rectangular. I think I will add some more on each side so that I could use it in a bag. I have a friend who is going to make one for me in return for something I did for her. It would look good on a large bag that I would use to go to sewing days. 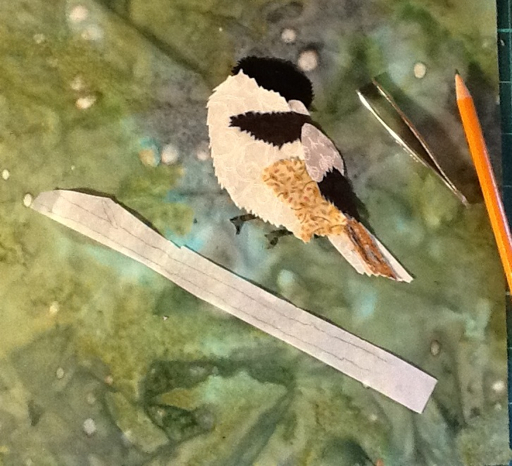 In the mean time, I've been drawing up a pattern for an appliqué chickadee which I would like to post on the day(November 20th) I will be featured in the blogathon. 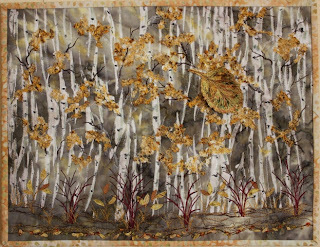 Also, don't forget to check out the Needle and Thread Network for lots of fiber art blogs. In case you haven't been reading my blog for long, you may not have noticed my fascination with trees. I only had a little time for fun sewing today as we went out for breakfast for the first time since golfing season, and I also had some clothing repairs to do. I hate them cluttering up my sewing space! 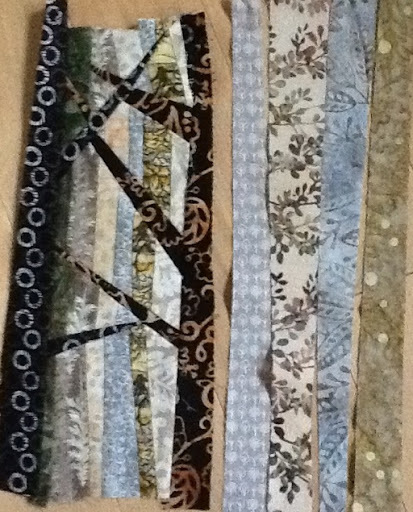 On the right you see can another 4 strips sewn together with an angled cut where I want the branch to go. In case you might think I know what I'm doing, I scrapped the first attempt. This time I actually laid a piece of tracing paper on top to audition the placement of the branches. If I hadn't been lucky on my first attempted tree earlier this week, I might have given up! Next, I've sewn a strip to the bottom edge and laid the top piece over it to line it up. I've sewn it in and you can see that it has the same effect as a dart in clothing (for those of you who may have sewn clothes). If you put in too many going all in the same direction, it will angle away from the central trunk. So, next I must figure out where to add some crosswise branches from the opposite direction to help straighten it out. For some reason, I totally forgot to take pictures of the projects at UFO today. I did some cutting and made 6 more blocks for my quilt. I'll get back to my art quilting next week. It's easier to take a quilt with me. 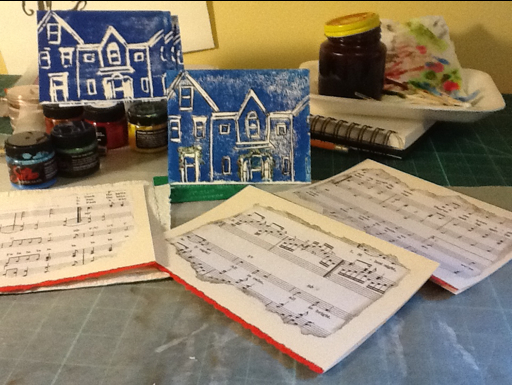 With my art work, I never know what I might need, so it's better to work at home. It's not the greatest picture because I had it laid out on the floor. Next time I'll get it up on my design wall. 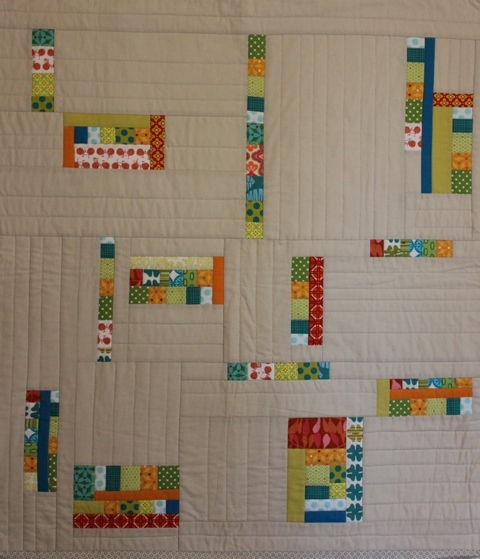 I've been thinking that a more apt name for my blog might be the schizophrenic quilter! I named my blog Through My Window because of how I'm affected by my outdoor environment and how that translates into my work. Lately, you might think that I'm all over the place with my projects! 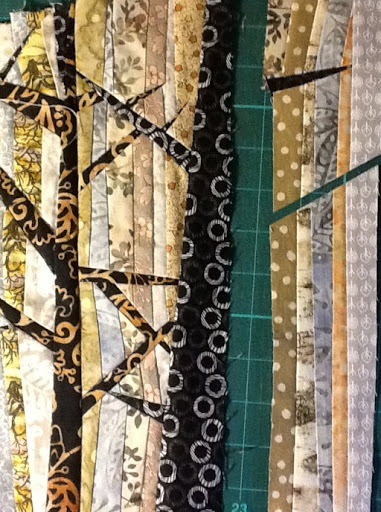 For one I like to switch back and forth between traditional and art quilting. When I go to guild UFO day or retreats, I often work on quilts. Due to my eye problem, I've switched gears again. 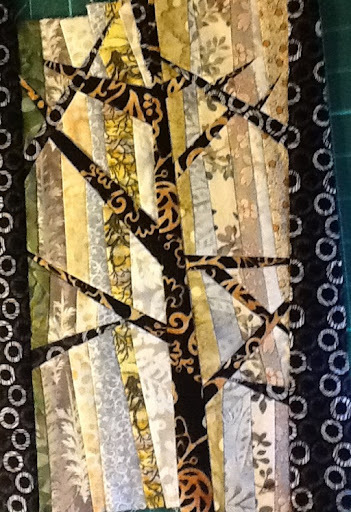 I was quite intrigued with the little 'tree' shown last post that I made in a free pieced style while at retreat. Since my eye issue is making it difficult to finish the thread painting on the birch tree piece, I switched to playing a little more with the free form trees. I do not have anything like an engineer's mind so I work out any problems as I go. Which means, of course, that some things don't work out as I'd hoped and I start again. I did document the whole process with my camera. Next time I put my actual computer on, I'll post some more pictures of how I did it. Tomorrow I'm off to a UFO day where I'll work on a current quilt that I keep packed and ready to go. I'm so looking forward to our time change and the extra hour of sleep tomorrow night. Have a great quilty weekend, whether it's sewing on one, or curling up underneath one! Today, I get to announce some fun news! 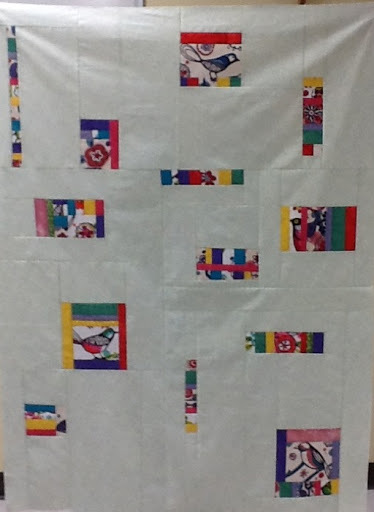 I've been asked to participate in Blogathon Canada which is sponsored by the Sew Sisters quilt shop. This is my first time participating in a blog hop, so besides being excited, I am little anxious. And guess what else!? Besides being able to perhaps find some new Canadian blogs, there will be a giveaway at each one on the dates listed above. 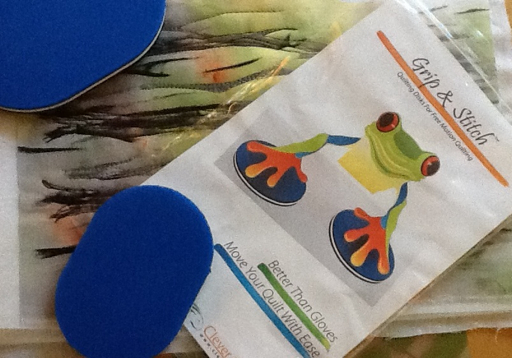 Each hostess will get to have the fun of choosing the goodies for their giveaway. So, that amounts to two giveaways per day! I hope you take the time to check them out. I know I will be as some are new for me too.